I have to answer in the classical way here: I’ve been writing for as long as I can remember. I’m not sure where the urge came from, but I know that it’s always been there: I just love creating stories. It’s called "Legacy", and was published in November 2015'. I chose to self-publish. Truth of the matter is I had an agent interested in the book, but after some cooperation, she pulled out, as she’d decided historical novels weren’t going to be part of her repertoire for a while onwards. By the time this decision came, however, I’d already made up my mind to self-publish. I don’t regret this decision for one second. It’s just lovely to be indie! From the book jacket: Emily Bradley, an orphan born in a brothel in London in 1784, flees after her first forced encounter with a client, Lord Charles Stanford. Five years later, he tracks her down and forces her into marriage in order to manipulate her and their son to secure his vast legacy. Emily must deny everything she is and loves, her art and her new country life, to keep the truth from his aristocratic family or face Lord Charles’ murderous temper. When she’s offered a commission to paint a portrait at the Royal French Court of Joséphine Bonaparte herself, Emily sees a chance to break free from her miserable life – but it means forming an alliance with the enemy of England, potentially exposing all her secrets, and possibly losing her son. Emily is forced into the hardest choice of her life: where her fate and her son’s future, hang in the balance. 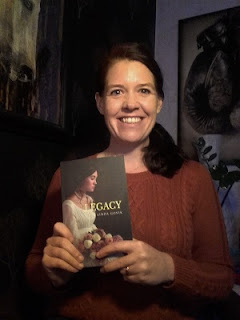 The inspiration for this book came from all those books I’ve read in the past that has meant something to me: those that contain strong, fascinating characters and dramatic twists and turns (like Diana Gabaldon’s Outlander, for example). I wanted to write something like that too, and above all, something that I’d enjoy to read myself. Indeed you can. It’s available on Amazon, Barnes & Noble and Indiebound.org, and if you live in Sweden, you can buy it straight from me, or through Adlibris.se. I’ve started on the sequel to "Legacy", and my goal is to have it finished in 2017. I also have some side projects, of which one is a contemporary mystery. My feeling at the moment is that I’ll publish it next year - but that’s REALLY a side project, and more for fun, so we’ll see what happens. 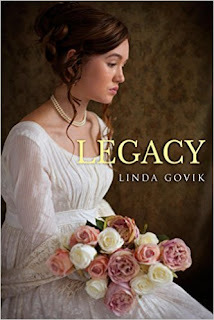 Well, I recently got the best compliment ever from one of my readers: she told me that "Legacy" woke her interest in historical novels, and that she now wants to know more about the era, the clothes etc. And this from someone who up until then had only preferred contemporary fiction! I love that – I mean, if you manage to convert a reader into trying a completely new genre, then you’ve done something right! Perhaps that I love connecting with my readers and I’m active both on Facebook and Goodreads. Befriend me, like my page or otherwise make yourself known – I’d LOVE to hear from you! Thank you for some lovely questions! BLOG WRITER'S NOTE TO AUTHOR: Your book sounds quite interesting. I've never really been a historical reader, but your story sounds quite compelling so I'll probably check it out. Good luck to you with your future writing projects, and thanks for the interview.